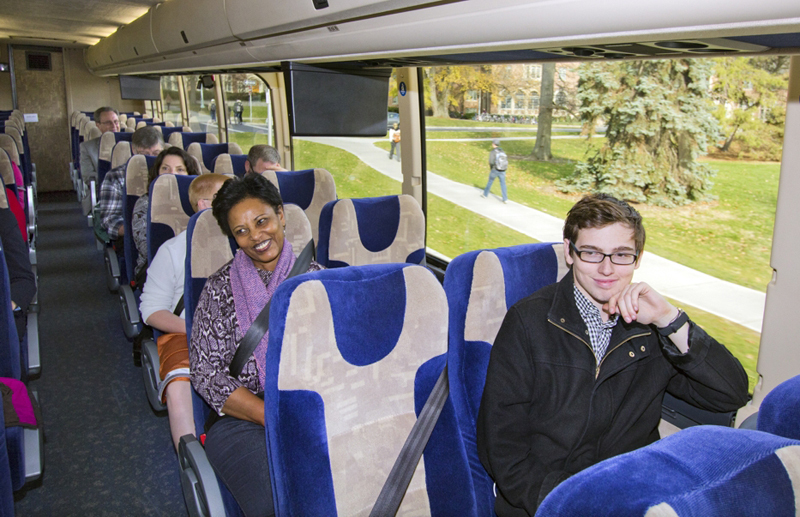 MSU business travelers can now prepay for travel on Michigan Flyer motorcoaches by charging the cost to MSU accounts. Our all-new motorcoaches offer comfortable seating, free water, free WiFi, 110 volt outlets at every seat, & 3-point seatbelts. 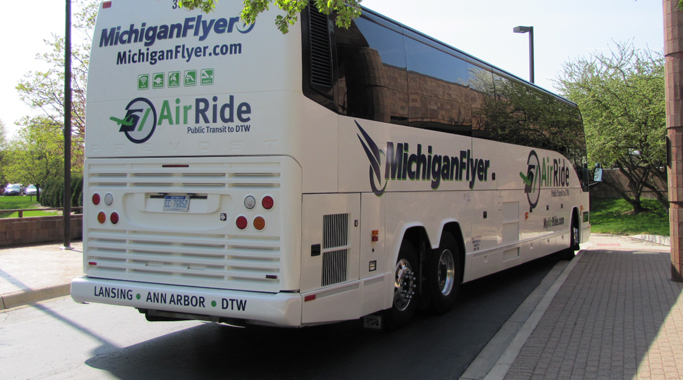 For thousands of business travelers, families, students and vacation travelers each year, Michigan Flyer-AirRide makes the trip more relaxing and cost-effective. 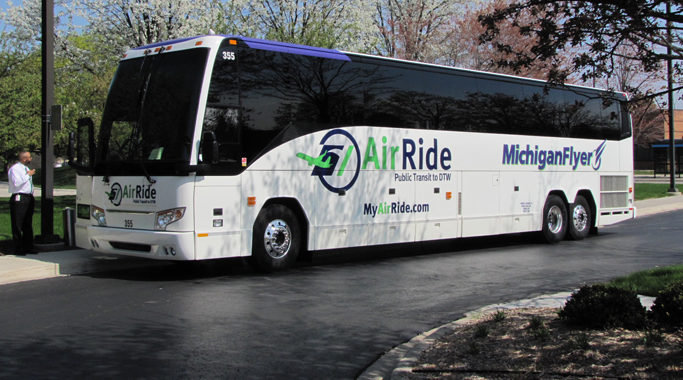 Michigan Flyer-AirRide proudly operates and co-brands our route in partnership with the Ann Arbor Area Transportation Authority. Effective July 13, 2018, we began picking up and dropping off passengers at one location on the Departures Level of the McNamara Terminal. 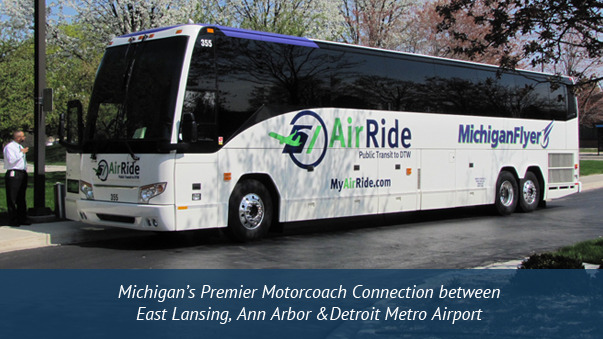 Reliable motorcoach connections between East Lansing, Ann Arbor, and Detroit Metropolitan Airport at affordable rates. For your convenience, we offer 12 – 13 round trips a day, depending on your boarding point. 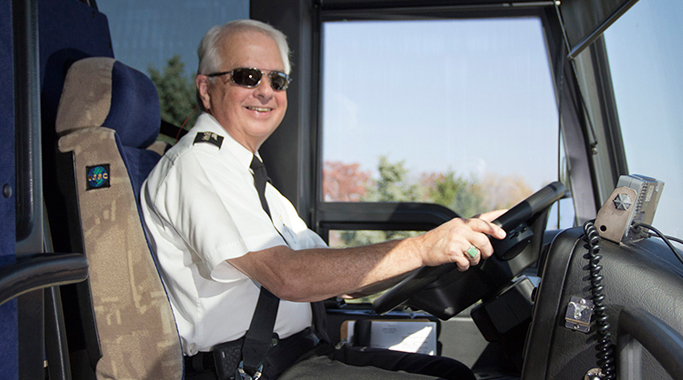 Our friendly drivers, comfortable coaches, free water and free WiFi help take the stress out of travel. Plus, you can leave your car for $2.50-a-day at our East Lansing and $2.00-a-day in our Ann Arbor parking locations. In short, Why Drive? Participants should not use the "Book a Trip" feature of our website to make reservations. Instead, GO TO THIS SPECIAL PAGE to buy your tickets and get important details about your transportation arrangements. 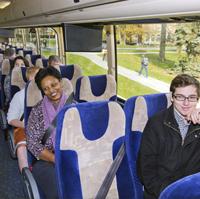 Track your Michigan Flyer-AirRide bus in real time with the FREE Indian Trails Bus Tracker app! Easy instructions here. We will go the extra mile to depart and arrive on time. That’s how we achieved our extraordinary track record of 98% on-time reliability. Because your safety and comfort are always our first priorities, however, we also guarantee that we will not jeopardize your well-being in order to stay on schedule in hazardous weather or other situations where safety may be compromised. 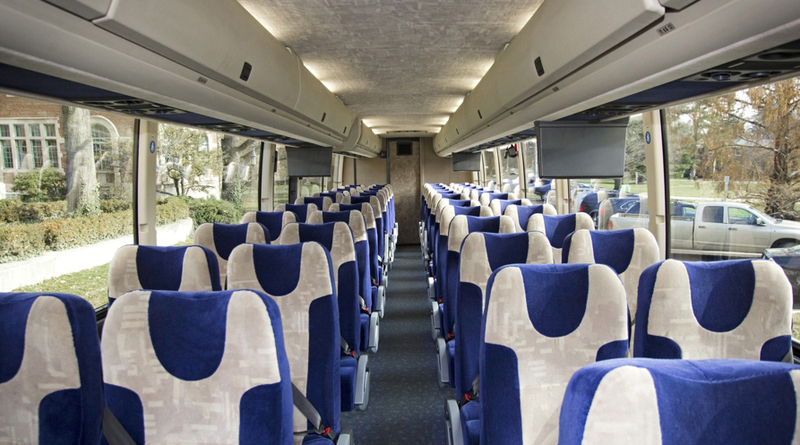 If you miss your motorcoach, in most circumstances we will accommodate you at no additional cost on the next coach that has space available. See details about changing reservations here. We will treat you with courtesy and respect, always striving to provide you with the most convenient, reliable, affordable and eco-friendly connections possible. Check out our passenger reviews on Facebook, Google, Yelp and TripAdvisor. Due to the Ann Arbor Goddess 5K/1-Mile Run on Sunday, May 12, some buses will go to the Kensington Hotel in lieu of the Blake Transit Center. Please check our 'Book Trip' feature.